For various reasons we had to juggle my itinerary for a couple of days. 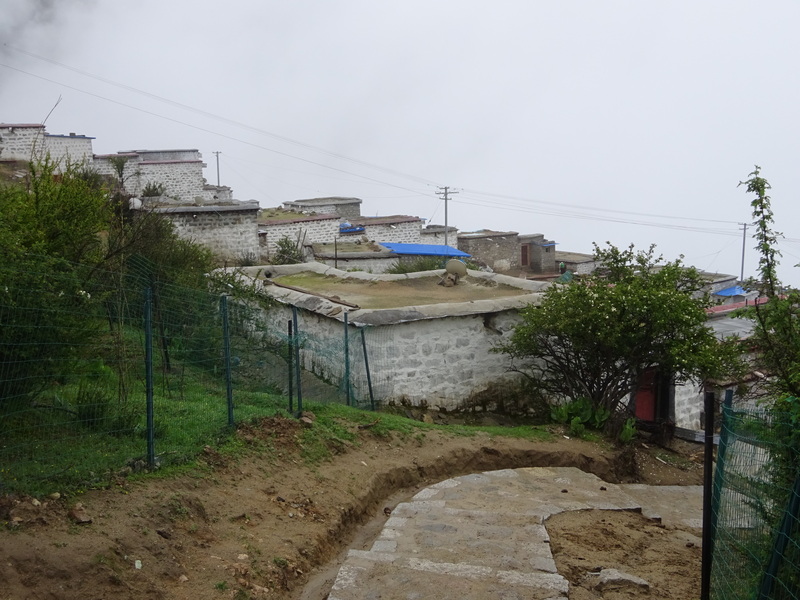 But I was insistent that I would not give up Gangri Tokar, the site of Longchenpa’s (1308-1363) hermitage cave. This is one of the main reasons I am here. Little did I know what was in store. Then again, even if I did know, I wouldn’t have cared. 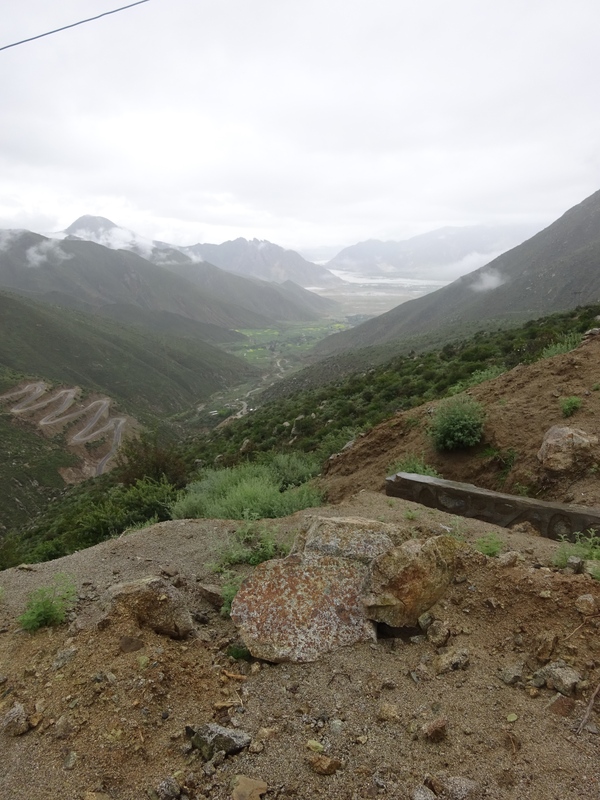 Once again, east from Lhasa, we turn off the main road, in this case a divided high-speed expressway, to follow a familiar scenario of winding lanes through low level villages, gradually turning up into a sparsely populated mountain slope. 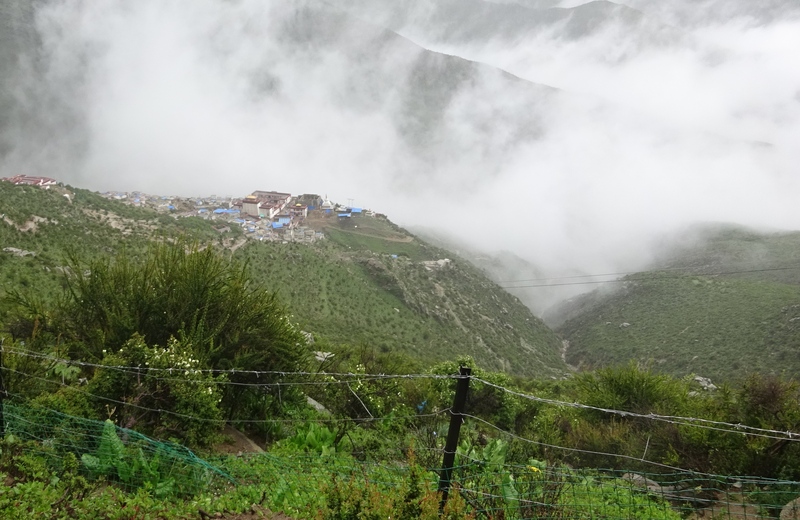 But here, unlike the gradual approach to Tsurphu, the road becomes steeper with more curves, sharp switchbacks too tight for the turning radius of our van. We are taken up and up, literally into the clouds. It has been drizzling all morning. 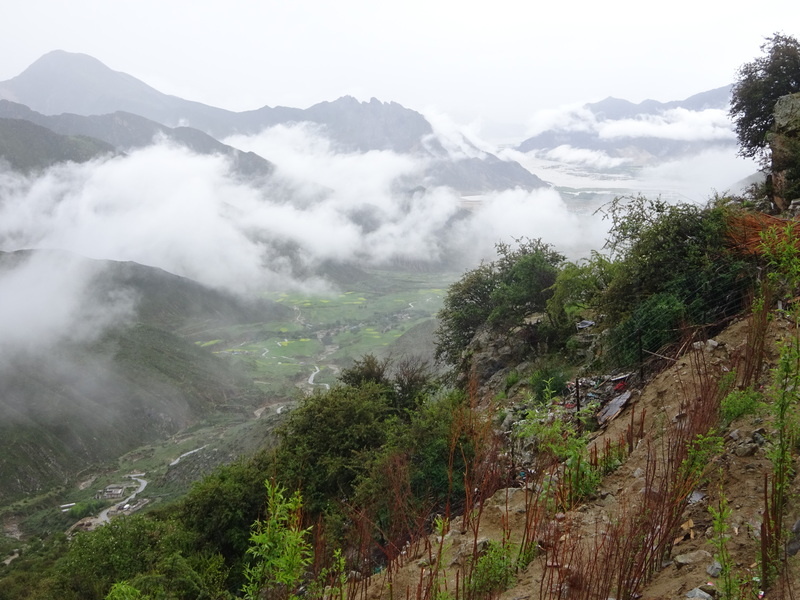 Visibility is very limited, but as we take the next turn, the entire valley all the way down to the Yalu river opens up. 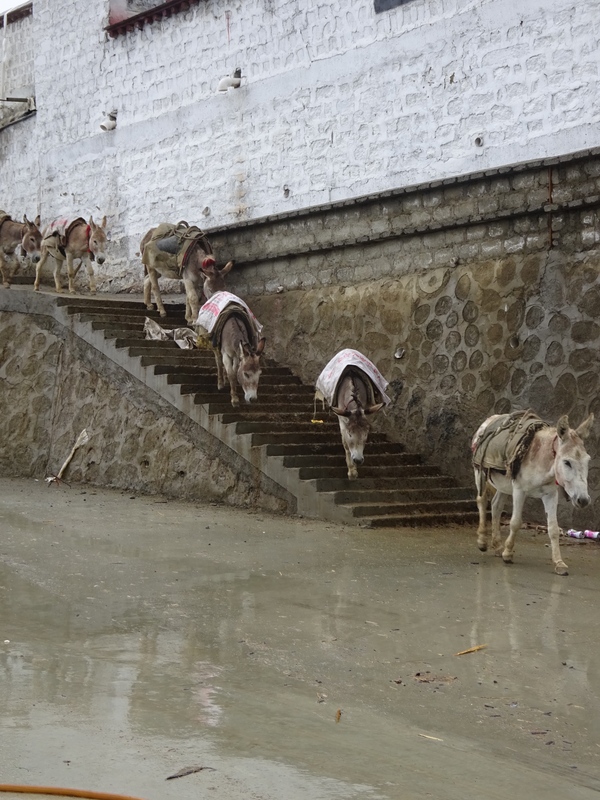 We continue our climb, eventually arriving at the monastic complex known as Shongsep Nunnery. 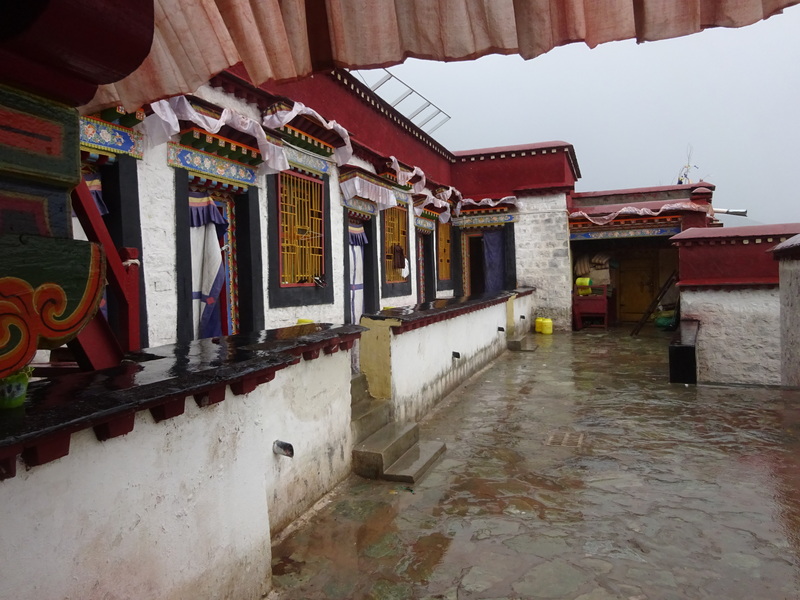 We are at 4400 meters, 13,600 ft.
Trudging up from the parking lot, we reach the courtyard of the main assembly hall. On entering, there is a difference between this place and other places I have seen. It is immediately apparent. 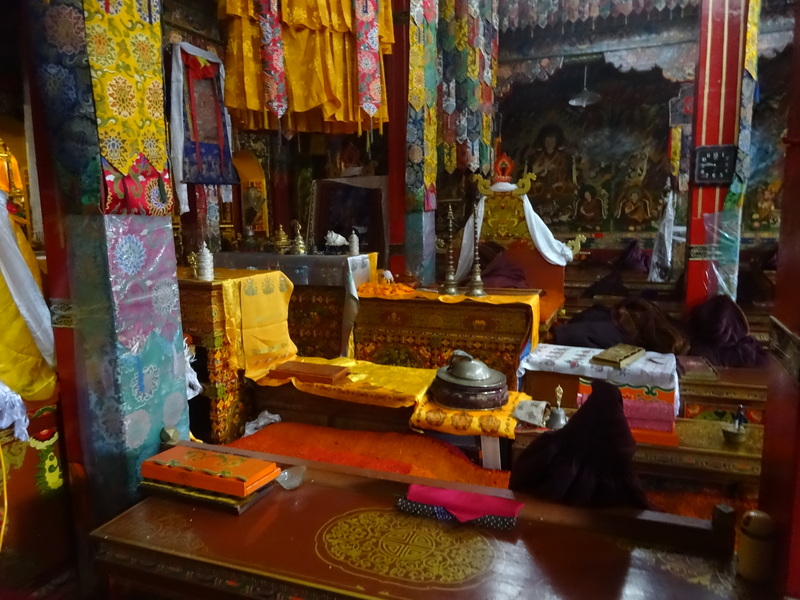 All the same elements found in most other places are here, traditional art on the walls (except for one wall containing traditional-style portraits of the founder of the monastery, Longchenpa and another figure I do not recognize), the guardians of the four directions, banners hanging from above, the pillars wrapped in carpet (and then plastic to protect the carpet from being torn apart by pilgrims), the rows of seats for the nuns, the teaching thrones. 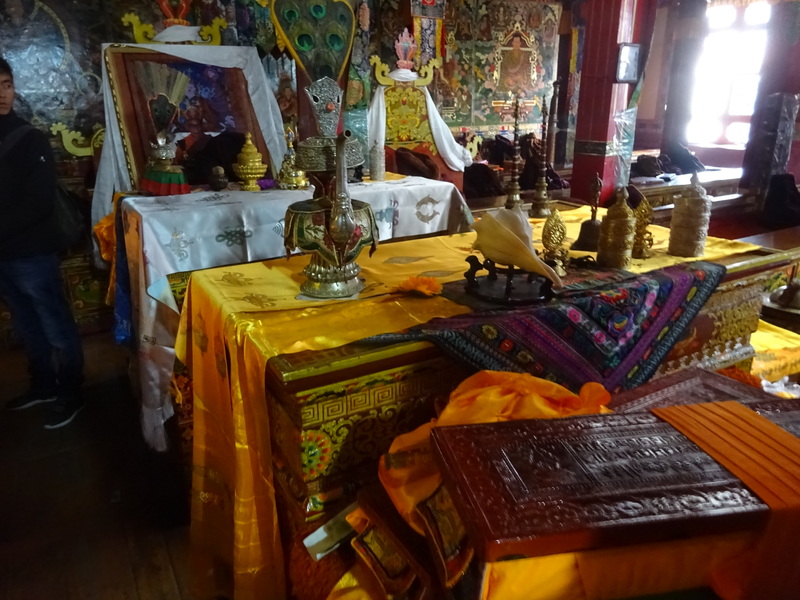 Nor was there anything unusual about the altars, though the colors and details might have been more elaborate. There was a quiet about this place, a peace. Not a dull or passive peace; it was an awakened peace, an active feeling, a sense that practice thrives here. It was alive. Very unusual and very beautiful. 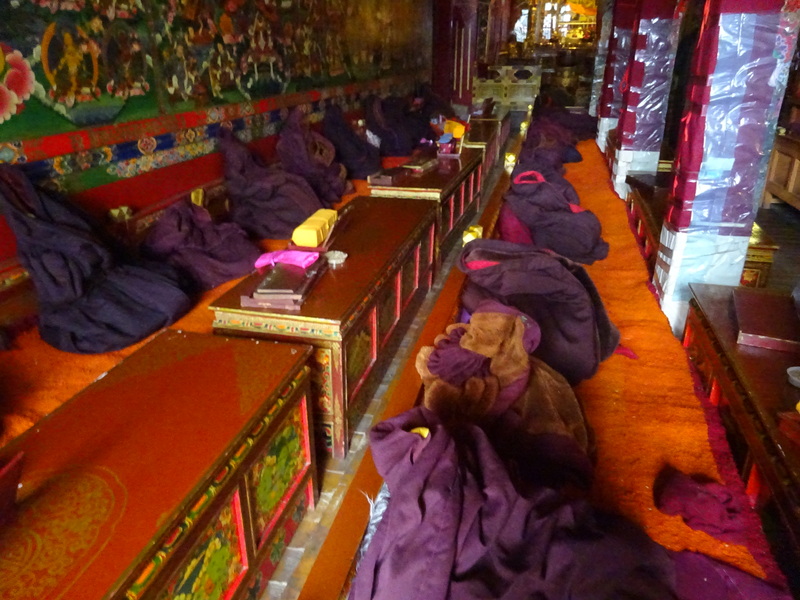 It was like stepping into a physical representation of a deeply fulfilling meditative space. the mind of natural perfection has no substance nor attribute. Very few westerners come to this place. Perhaps that’s why I was granted permission to take photos. We, my guide and I, took our time wandering through, savoring every detail. 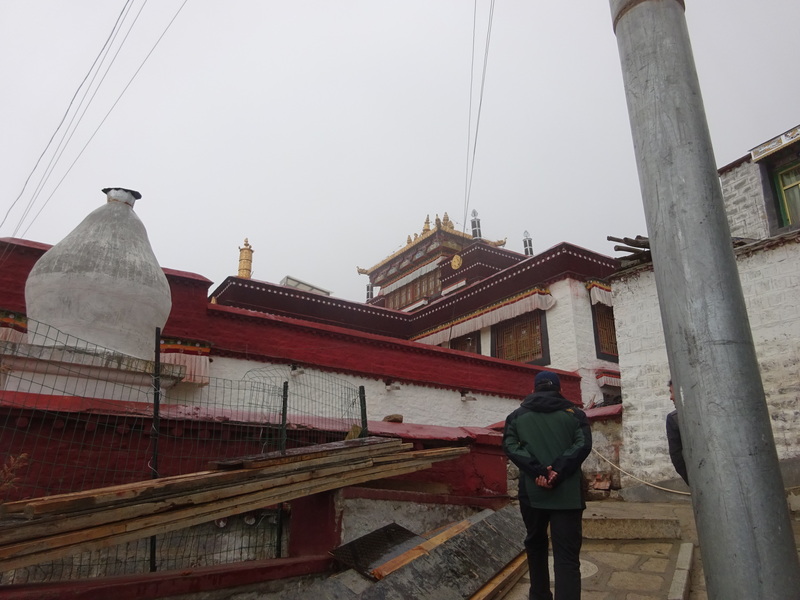 By now we had connected with one of the nuns who guided us. I was able to express what a special place this was. Shongsep is relatively new, founded in 1904. It was completely destroyed during the Cultural Revolution and rebuilt. It was completely destroyed again in 1983 for unknown reasons. 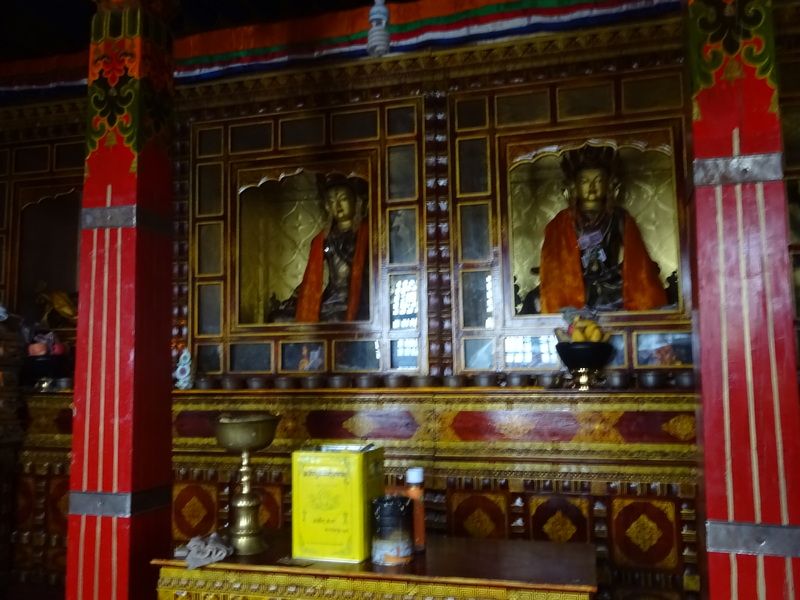 Perhaps the Chinese simply cannot stomach the idea of women devoting themselves to the dharma. That’s truly dangerous. It was completely rebuilt again. 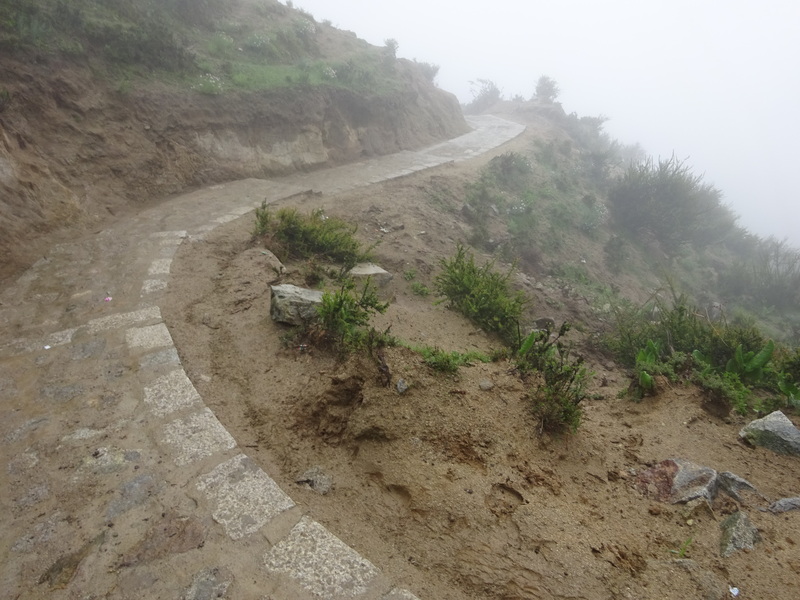 Now the moment of truth: the climb to Gangri Tokar (Kang-ri Thökar) The clouds obscured the view above. It was just as well that I not see how far I had to go. We simply set out on a well-constructed stone and concrete path, winding up the hill, switching back and forth frequently. It was raining. I carried an umbrella, my eyes glued to the path, looking up occasionally to see my guide and driver putting some distance between themselves and me. I passed four sets of steel benches, rest points that I couldn’t take advantage of because they were soaked, but I dared not sit anyway. Just focus and keep going. I wasn’t keeping track of the time. I was keeping track of my resources. But really, there was no way I was not going to go all the way up, even not knowing how far it was. 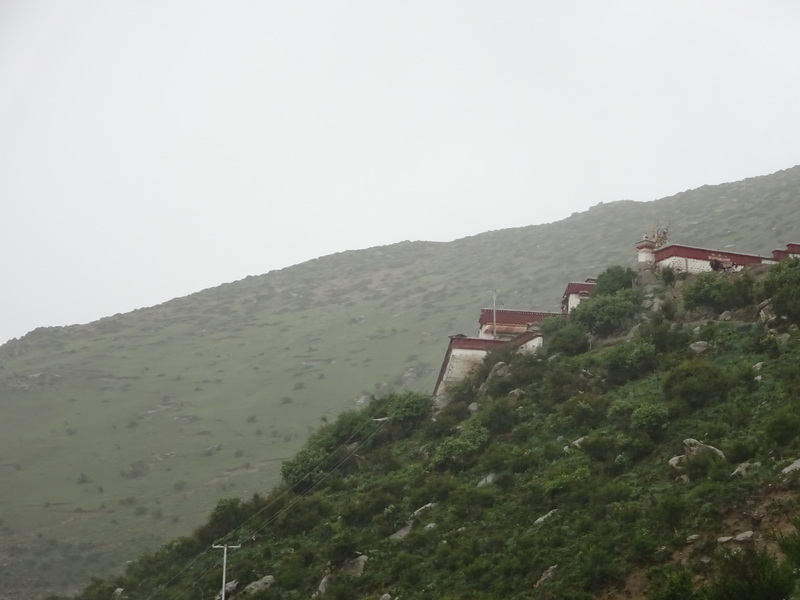 After 40 minutes or so, I’m guessing, the sky cleared a little and I could see my objective, a small multi-level structure set in a niche on the hillside, another 150 meters up. The rain had been increasing the higher I got, the wind and chill as well. I also knew I was well above 14,000 ft., maybe closer to 15,000. It took me another 10 minutes of dogged progress to get there. 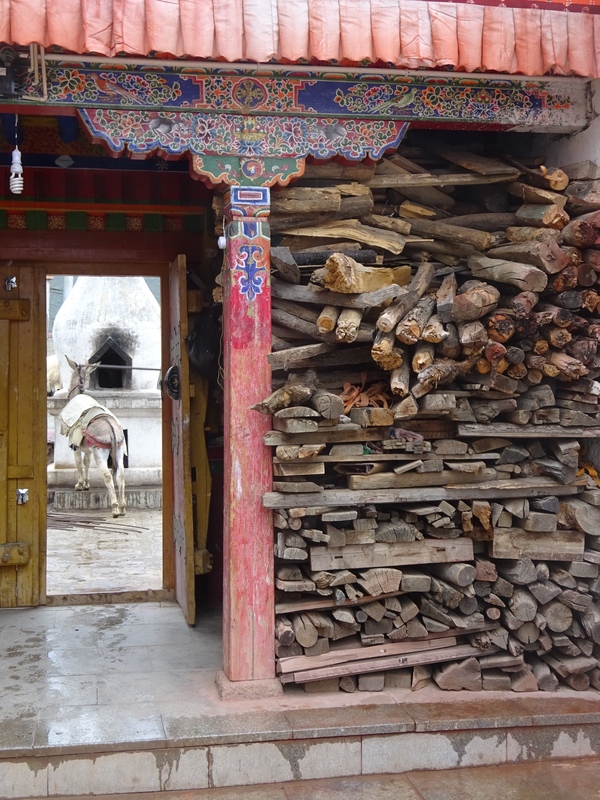 I walked up the last few steps, through the wooden gate and onto a small courtyard. Ahead was my guide, waiting for me, holding open a heavy curtain at the doorway. I dropped the umbrella at the threshold, pulled off my hood and hat and carefully stepped inside. 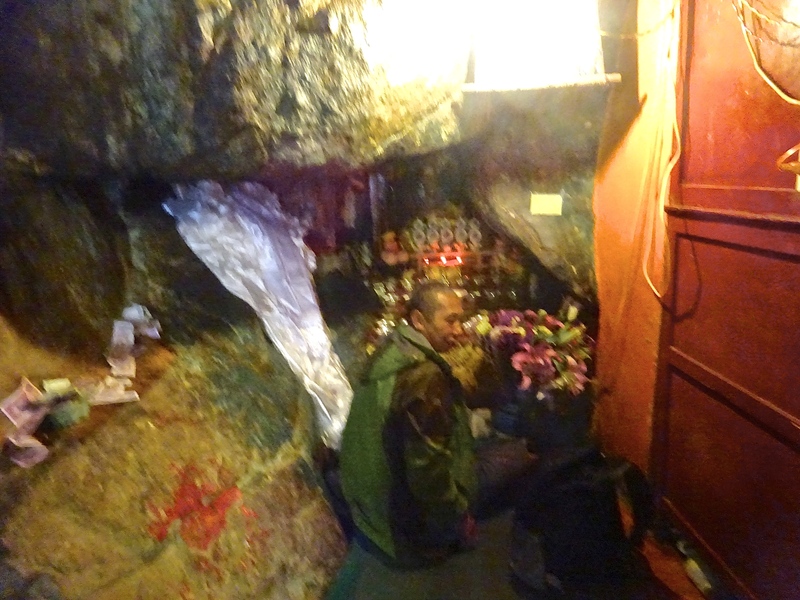 A clot of pilgrims, mostly women and mostly elderly, stood just inside the door to the left, working their malas, a few more huddled on the floor next to a bench directly ahead where a half-dozen nuns were chanting mantra. All the ladies were looking at me, smiling, especially the half-blind one on the floor. Through the welling of my own eyes, theirs all said the same thing: welcome home. 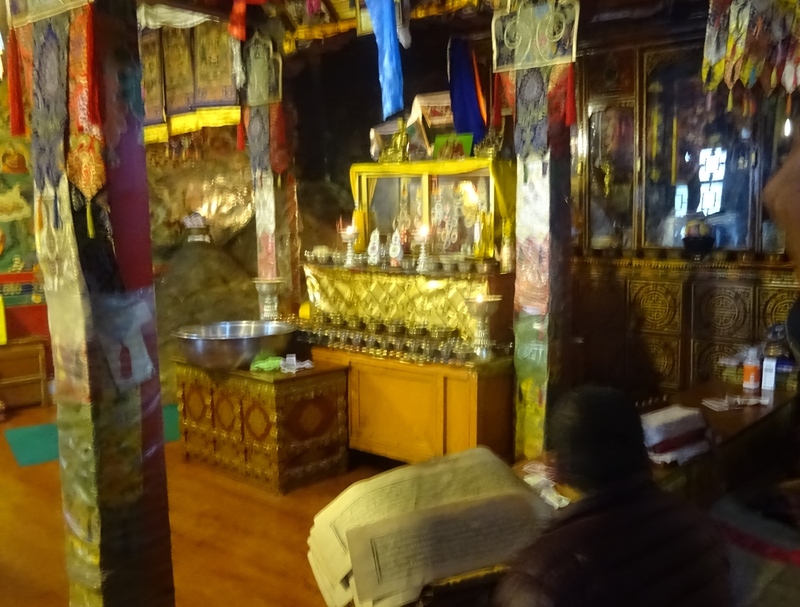 This is the actual cave place of the Omniscient One, Kunken Longchen Rabjam, Drime Ozer, The revered Master of Infinite Realization, the Second Buddha, where he spent the latter part of his life and composed a great part of his voluminous and widely known Seven Treasuries of Dzogchen texts. My heartbeat had slowed to resting rate. I was grounding in the reality of what this figure has meant to me in recent years, what he means to me now and what it has taken to get here. He clarifies every question, every struggle, every wandering misstep, every misguided effort. His poetics awaken me from every form of sleep. Some people find his style impenetrable. But for me, there is no greater clarity. The walk down is easier, of course. But my legs were rubber by the time I got down. The weather had cleared some. This view is worth everything, every effort, every cost, every obstacle. Every question is overcome, every knot loosened, every veil lifted, every tangled intention dissolved into emptiness. conceptual clarity or dullness, but as spontaneous joyful creativity. Its reality is nothing at all. 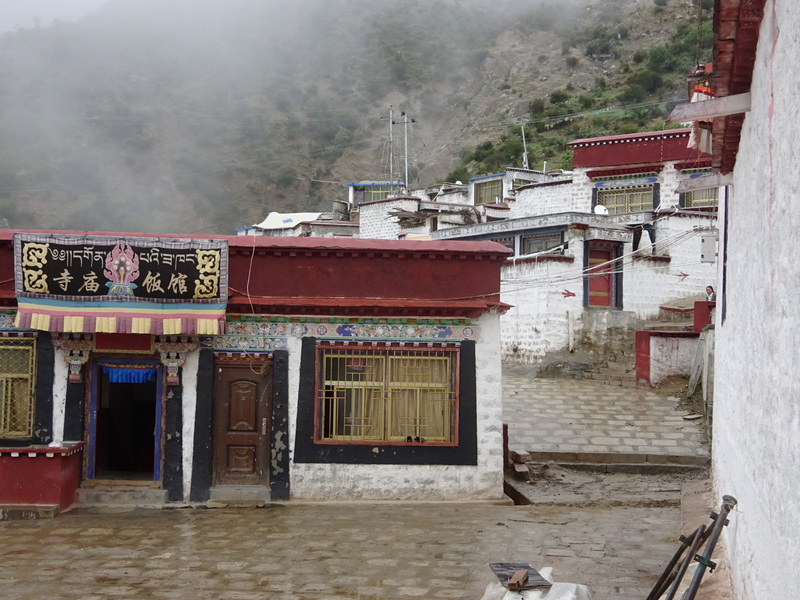 This entry was posted in Buddhism, Personal, Tibet, Travel and tagged Day trips from Lhasa, Gangri Tokar, Longchen Rabjam hermitage, longchenpa, Longchenpa hermitage, Shongsep nunnery, Tibet Autonomous Region travel, Tibet Travel by garyhorvitz. Bookmark the permalink. Hugs to you and the rebbetsin. How I envy you! Thanks for sharing. 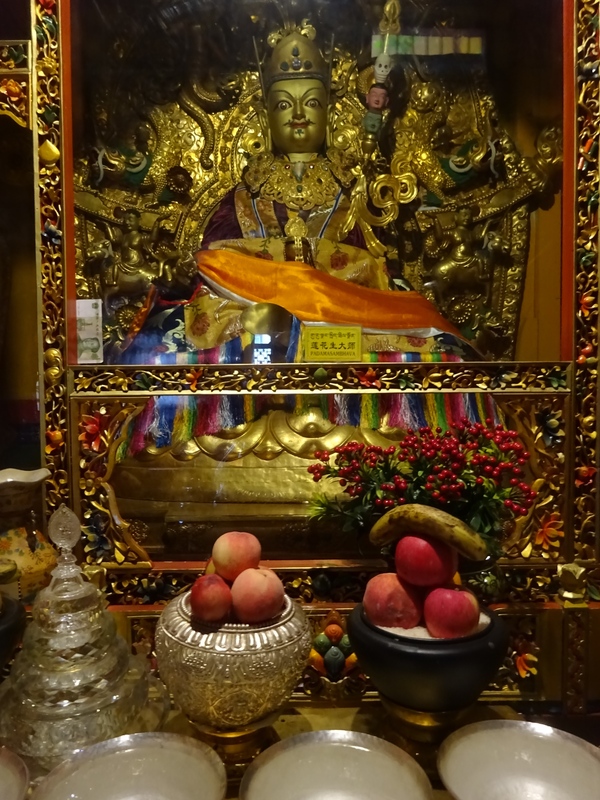 How fortunate that you are one of those who have a deep connection with Omniscient Longchenpa! The blessings are immeasurable-truly amazing. If I can ever help you, let me know!